In these pages you'll find a retrospective of the first ten years of my photography, including ten of my favorite photos. This post was written in 2009. I bought my first "real" camera in January of 1999 in Hong Kong. I had had point&shoots before, but wasn't happy with their limitations, so the very first thing I did when I arrived on my first trip to Asia was to head to Stanley Street. The street was (and still is) famous for its photography bargains. I headed on a whirlwind tour of mainland China with the study abroad group I came with, visiting Guilin, Beijing and Shanghai before returning to Hong Kong for the semester. I shot this photo on that trip, on one of the very first days. We were on a river boat tour, admiring the stunning scenery in and around Guilin. The water level was low, so we stopped at a small village which usually doesn't get tourists (so we were told). I bought a Canon 50E with nifty focus points which could be changed just by looking at the point through the viewfinder. I still wonder what happened to that technology - it worked even while wearing eyeglasses! Not knowing much about photography at the time, I had read that Velvia was the best film. At 50 ISO it was much slower than the 400 ISO negative film I was used to, but after seeing the results I didn't look back. I received some surprised looks walking around, as I was probably the only six feet tall blonde Nordic guy around. 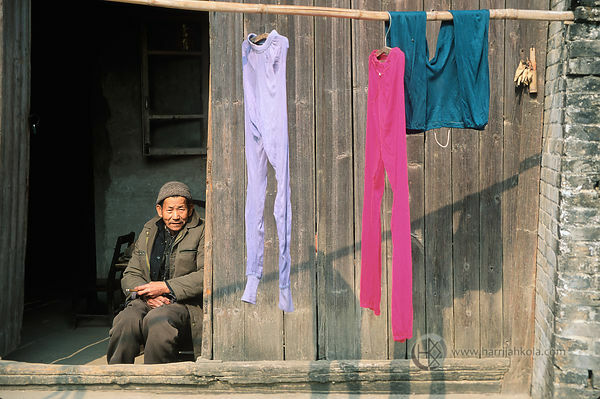 I saw this elderly gentleman, and was struck by the incongruity of the colorful laundry and his weathered looks. He seemed just as struck by how I looked. I smiled, pointed at my camera, and he returned a smile. I took this shot which I still consider one of my best. Taken on the same study abroad trip in 1999, this is also a shot influenced heavily by the photography in National Geographic. 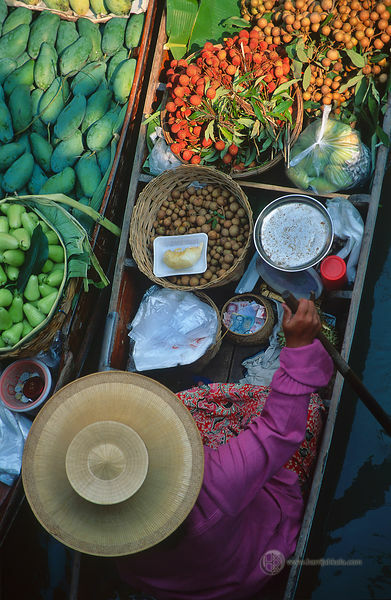 There are a few floating markets in and around Bangkok in Thailand. They are mostly tourist traps, but I was relieved to find that the one we went to was an active, actual market where locals sold fresh produce to other locals. I was struggling to find a vantage point which didn't have throngs of overweight western tourists ruining the scene's Thai authenticity*. I found a great place for the shot by standing on a walkbridge, looking down. As the boats passed, I could easily avoid any visual distractions, and concentrated on the most representative and visually pleasing image. I spent several rolls of film, and captured this. The dynamic range of the photo was a challenge: the water was dark while the upper part of the frame was quite bright. Only the second 16-bit scan had enough information in it to make a usable file. I love the bold Velvia colors, and the detail throughout the frame. * I've always been suspicious of travel photography which is not true to its locale. I appreciate photography which is done to preserve a dying custom or an ancient technology barely in use anymore, for example. But I find it disingenuous to present such photos in a context which falsely implies they are commonplace. Even worse, many of us tourists romanticize such photography as quaint and authentic, no matter how anachronistic and dishonest the locals might feel the portrayal is. Since it was clear this market was in actual use by the local Thai people, I feel this angle gives the right context for the photo. Virginia Military Institute, my alma mater. The Institute has been the most formative experience of my life, and I appreciate the integrity and discipline it instilled in me and all its Alumni. This photo epitomizes the rat year, known as freshman year for everyone else. Taken off a stoop in the Old Courtyard inside the VMI barracks. The cadets are in parade gear, and so are the rats - some of them made it through the rat line to become cadets later. Delta Company Sergeant-At-Arms is administering punishment to a rat for an infraction during the parade. His brother rats join him in pushups for solidarity. Sveltering summer heat makes the punishment even more effective and memorable. 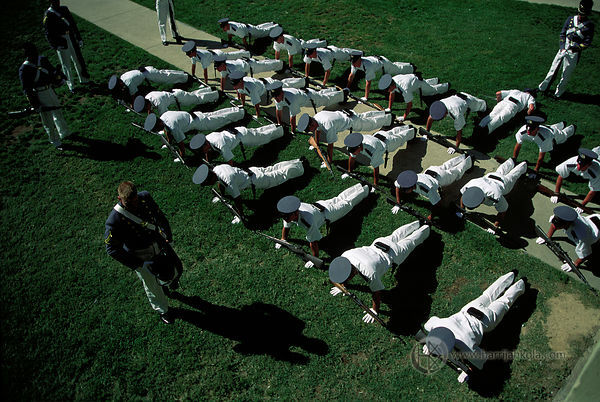 Everyone who carries the VMI Ring has gone through this crucible, including Hell Week during which the Cadre teaches the rats the basics to prepare those who make it to become cadets, and the Breakout, which is also depicted in my US gallery. Certainly not for everyone, but the citizen-soldier ethos dating back to ancient Greece is just as important and relevant as it was over two thousand years ago. This was taken on a road trip with a bunch of friends, taking us from the Netherlands to southern Spain and back. We visited Parque de las Ciencias (Science Park) in Granada, and I was elated to have the opportunity to witness a "flight show" with several birds of prey. 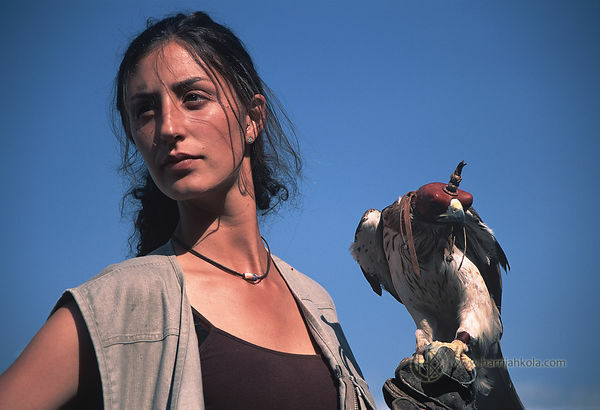 The beast here is a Saker Falcon (falco cherrug) and the Iberian beauty is its handler! Although the falcon was hooded so it wouldn't get stressed with all the people around him, it was alert and ready to hunt the second the hood was removed. This was the first time I was in such a dynamic shooting situation, but I managed to get a few good shots. I burned through three rolls of film during the show. This is one of my all-time favorite photographs I've taken. I love the stark contrast between the beauty and the beast - yet they both exhibit a similar intense demeanor. She's not posing, but she and the bird show a symmetry in the composition, contrasted by the diagonal lines. These colorful buildings in Sighisoara, Romania really captured my attention while walking in this historic town. 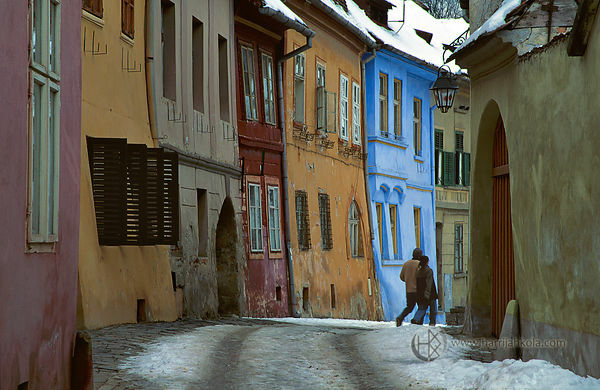 Sighisoara is the birthplace of Vlad the Impaler, a Romanian tyrant who was the inspiration for Bram Stoker's Dracula. The old town where this shot was taken is an especially serene location, and offers quite a few beautiful scenes for the traveler. Shot on film, this was a place where taking a good photo was not especially challenging. To avoid a static shot showing only the architecture and colors, I waited a few minutes for people to walk into the frame, and got the couple for context. I have an almost identical shot taken in Poland on the website. I wonder where I'll find the next similar location! Lonely Planet Sicily recommended this old abandoned tuna port and factory near Scopello, and it is certainly in a location I wouldn't have found accidentally. The Tonnara itself is in poor shape, and I was more interested in this stunning view from the piers. Reminiscent of the karst hills of Guilin in China, there I was facing a huge rock jutting out of the Mediterranean in cool January weather. Seagulls circled the rock; I'm sure in fewer numbers than when fishermen frequented the waters. Shot on a tripod with medium format Velvia, I was trying to get the exposure right so I could get some detail in the sky, while retaining detail in the deep shadows in the foreground. 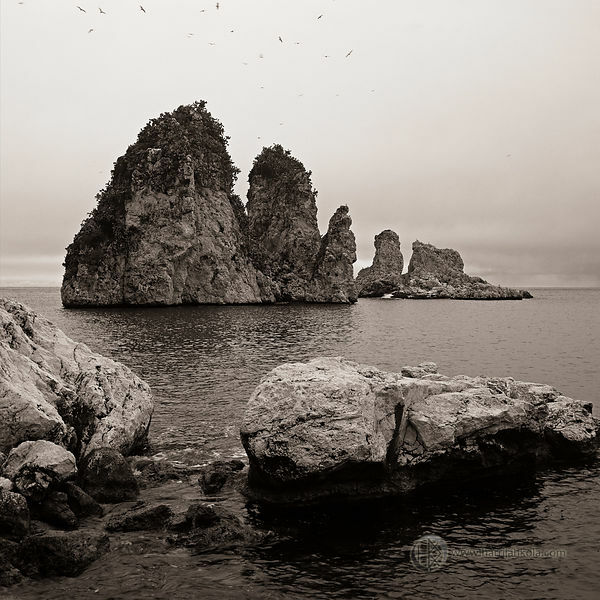 The scan turned out well, and I have a gorgeous 70x70cm print on my wall. As you can see the horizon is smack in the middle of the frame, thus breaking the photographic rule of thirds - but rules are meant to be broken! I was a late adaptor of digital cameras. I bought my first dSLR, a Canon 30D, in 2006 on my trip to the five year reunion at VMI. From B&H Photo in NYC, where else! I immediately embraced the opportunities digital offered. I've always been fond of low light photography, and enjoy the challenge. Going digital has made it much easier and faster to shoot scenes like this; but I still enjoy shooting medium format film. This photo of NYC Central Park sunset is by far the most popular on my website, and I certainly don't mind that: it is one of my favorites as well, despite its obviousness. 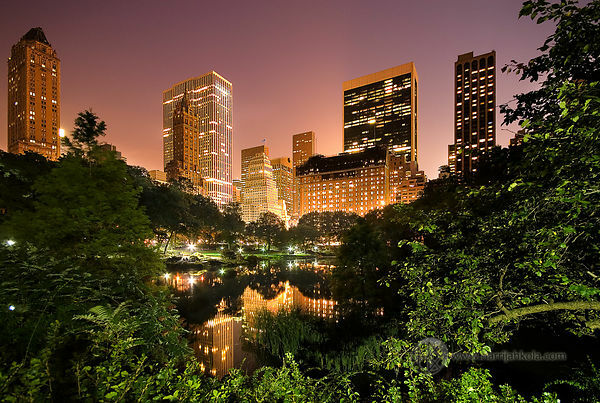 Sunsets in general are overdone, Central Park is one of the most photographed locations in the world, and technically the photo could be better. But it is pretty, and I took it. I bracketed the photo to capture the huge dynamic range of the early evening scene. This means I took two shots, one at 10 seconds, one at 88 seconds - I meant to do 90 but was too eager. In my defence it's not an exact science. This way I could avoid overexposing the bright buildings in one shot, while the other would be light enough to retain details in the shadows. I blended the resulting shots in post-processing, and a result is a quite pleasing shot with a compressed dynamic range suitable for printing and web use. These days people use HDR for similar effect, although it's often overdone. I think I succeeded keeping this early example realistic, and I still prefer digital blending over HDR for most situations. 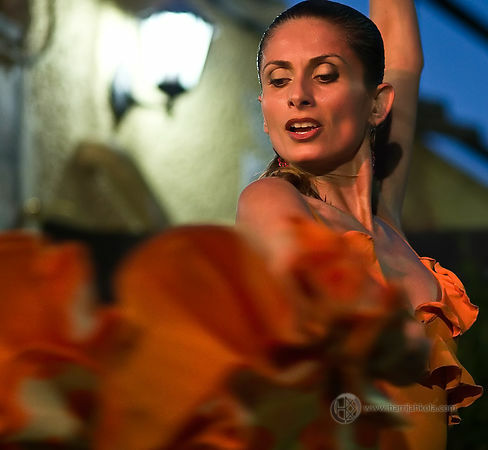 We visited a local restaurant near Mar Menor in Spain, which included a flamenco show after the dinner. I was quite excited, and brought my camera with two memory cards and a portable hard disk as I knew I'd be gunning. Again, such dynamic scene is not my specialty, but the reward was this shot of a traditional Spanish dance, still very popular - and for a good reason as flamenco is a feast for the senses. This shot has it all: movement, pose, poise, color, sharpness, good bokeh in the background, and a beautiful lady in the foreground. It also has one of the strongest compositions in my portfolio. Perhaps I should get out of my photographic comfort zone more often! 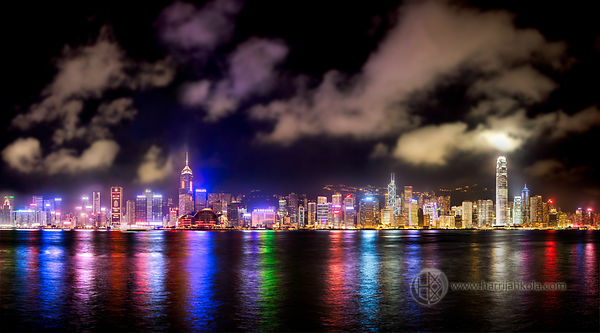 The most stunning skyline on earth - I hope I have done justice to the magnificence of Hong Kong at night. After nine years I returned there, planning this panorama for years - and I'm happy with the results! Taken from the pier in Tshim Sha Tsui, this wide panorama shows all Hong Kong Island landmarks, from Hong Kong Convention and Exhibition Center at left to International Finance Center 2 on the right. This is a 218 megapixel stitched and bracketed panorama, and technically the most challenging photo I have created. Shooting took "only" 54 minutes, but post-processing took too many hours to count. I used one lens for three rows of photos of the buildings and water, and also captured the sky with a wide angle lens. Everything bracketed at 0.5, 10 and 30 seconds. The result was a 3+ gigabyte file, which was digitally blended (not HDR) to avoid noise and maximize control. And it prints as big as any wall takes; I'm still waiting for a place big enough to do justice to a print of this! Finally, a very recent photograph from Ireland. I talked to local friends and acquaintences, and someone recommended Howth, which is a short DART train ride north-east of Dublin. A sleepy fishing town in winter, it has numerous captivating photo opportunities. The weather was quite cool, but sky was mostly clear and there was no rain - a rare opportunity this time in the Irish year. This is taken with a wide angle prime lens, three bracketed vertical shots, handheld. Such projects are not normally recommended to be shot handheld, but shooting a wide angle lens meant there's less chance of motion blur. I was also able to brace my elbows on a fence. Parallax error was not an issue despite the close proximity of foreground objects. I've always been skeptical whenever someone tells me something can't be done. Bold action brings the best rewards. The boats were so bright that I ended up toning down their color a bit to make this more believable - the orange boat was practically fluorescent! That is a small collection of some of my favorite images from the first ten years. I'm looking forward to the next ten, and have some new projects and directions I'm taking with my photography. Thank you for your interest!